You may have heard the term “low-income housing” from friends or community resources, but aren’t quite sure exactly what’s involved, or how to get access to the help you need in getting affordable housing. You’re in the right place to get answers to some of your questions about low-income housing programs. Affordable housing options were developed in the 1930s as a way of providing safe shelter for vulnerable populations such as low-income families, the disabled, and the elderly. Today, over a million households are public housing units, which are funded by HUD (The U.S. Department of Housing and Urban Development) and managed by local HAs (housing agencies). Am I Eligible for Public Housing? In order to qualify for housing assistance you must meet low-income guidelines for your area. Factors that are taken into account include annual gross income, status as elderly or disabled, U.S. citizenship, and references from previous landlords. Housing agencies can reject your public housing application if you have a history of negative habits that could impact others in the housing units. Income limits vary due to cost of living in a specific area and other factors. For example, California income limits are drastically higher than much of the rest of the country due to the high cost of living. Specific requirements may vary from county to county as well so it is important to check with your local housing agency for details. Unlike many other government programs, you cannot apply for HUD housing online. You must visit your local HA and fill out an application in writing. What Happens after I Apply for Public Housing? Your local housing agency will notify you of the outcome of your application in writing. In the case of denial, the HA will inform you of the reason, and of your right to request an informal hearing. If you are approved for HUD housing, you will be put on a waiting list. If there is space available immediately the HA will let you know, but it is very common to have to wait – even up to a number of years – before a unit opens up. Agencies are even sometimes forced to close their waiting list for a period of time, due to the long queue. How Much Does Low-Income Housing Cost? Your rent will depend upon your monthly adjusted income, which is determined by your gross annual income minus allowed deductions. Your rent will be the greater of 30% of your monthly adjusted income or 10% of your monthly income. The minimum amount of rent that may be charged is $25 to $50, as determined by the local housing agency. How Long Can I Live in Public Housing? In general, you can stay in low-income housing as long as you adhere to the conditions of your lease, or until/if your income changes to the point that you can obtain housing on the public market. 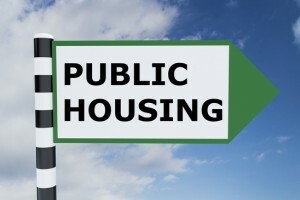 There are many varying factors in determining your eligibility for public housing, so it’s important to get in touch with your local housing agency in order to find out the details.